“Take 30!” Instantly our entire student body fell silent and closed their eyes. I peeked to see the reactions of city officials who were guests at our ribbon-cutting ceremony. Their incredulous expressions said it all – wow, that was extraordinary! 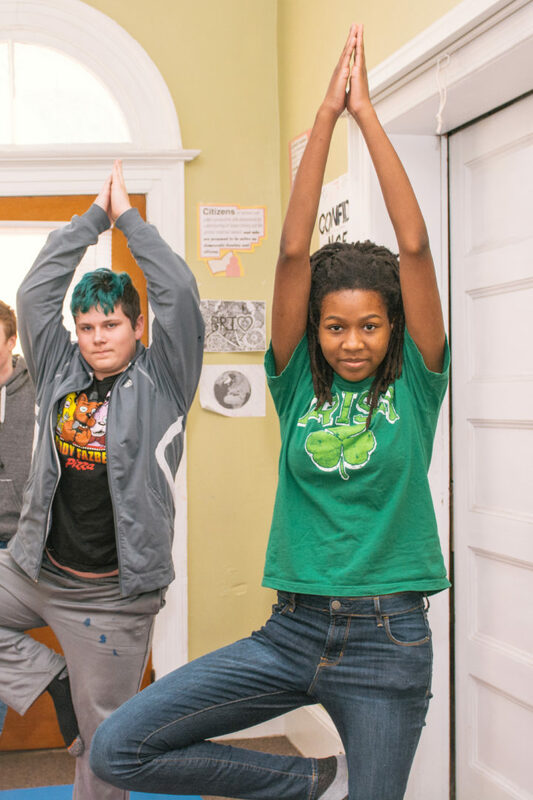 New Roots Charter School is a small public charter high school in Ithaca, New York, designed as a fully integrated model of education for sustainability at the secondary level. Authorized by the State University of New York, we first opened our doors in 2009. “Take 30” was integrated as a school-wide mindfulness practice in Fall 2015. The surprising, multi-faceted benefits of this simple practice inspired us to design a Wellness course for students in our lower school (grades 9 and 10) that integrates yoga and mindfulness practices with elements of a traditional physical education and health curriculum. Together with our Farm to School meal program featuring 75% locally sourced foods and produce from local farms, these practices have become an integral part of a culture of wellness at New Roots that links personal well-being to that of our social relationships and environment. 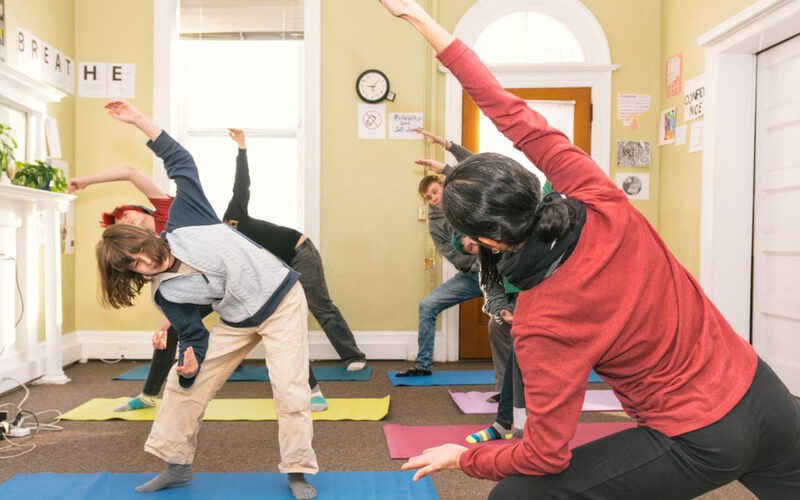 Mindfulness practices, meditation, and yoga as elements of a wellness program at New Roots have been present since our first year, but are only now beginning to fully take root. The foundation was laid by several years of periodic professional development offered by our Academic Dean, Kris Haines-Sharp; a meditation as an elective class taught by our Dean of Student Life, Jhakeem Haltom; and yoga classes taught by our current Wellness teacher, Tanya Kingsley. Take 30 grew out of this work as a targeted strategy for helping all members of our community access mindfulness practices regularly and experience the positive benefits personally and as a group. Despite early exposure and successes, it is only now in our third full academic year of implementation that mindfulness practices like Take 30 have become fully embraced as part of our culture. Administrative team members who were leading the way came to appreciate the importance of starting with small steps to allow the necessary time for a culture shift to happen naturally. Our first and most important step was cultivating teacher support for Take 30 as a practice to start every class period. In the first year we did not achieve a consistent practice with students, but we did establish a routine practice in staff meetings, and provided teachers with access to the considerable body of research documenting the value of mindfulness in educational settings. Teacher Audrey Southern describes her initial resistance, and why she was soon won over. “At first, it was difficult to consider giving up even 30 seconds of instructional time. What I have found is that by taking 30 seconds and pausing before diving in, class time is actually more productive, students are more focused, and I am more focused.” Audrey also reports that another positive outcome is that her students in grades 11 and 12 report using the practice prior to big tests and college interviews. Building on our success with Take 30 and drawing on lessons learned, we developed a new Wellness course, which is taught by Tanya Kingsley, a certified yoga instructor who started her teaching career at New Roots as a Spanish teacher. In her first year, Tanya’s work with students has been based on the Mindful Schools Curriculum. Regular practices in her course include reflection on mindful vs. mindless actions, body scans, awareness of breath, and kindness meditations, in addition to basic yoga practices. Practices such as mindful nutrition, in conjunction with studies of nutrition featuring community experts, help expand students’ concept of how mindfulness can be applied to enhance all aspects of their health and wellness. Entering our Wellness studio, students experience an immediate shift in consciousness along with the removal of their shoes. There are no desks or chairs in the classroom; students are invited to take a yoga block or blanket to sit on and to create a space on the floor where they will be comfortable. When all are present, Tanya introduces the theme of the class, and invites students to assume a mindful posture and begin working with their breath. Tanya describes mindful posture as sitting with back tall; shoulders over their pelvis; knees level with their hips or lower (with props to support their sitting posture as needed); arms light; hands placed on their knees, thighs, or lap (wherever they feel most comfortable); eyes closed or in a soft gaze at the floor. Once seated, students are invited to bring awareness to their breath, any sensations in the body, and the activity of their mind. Developing her wellness curriculum, Tanya has drawn on resources such as Learning to Breathe: A Mindfulness Curriculum by Patricia Broderick; The Way of Mindful Education and The Mindful Education Workbook by Daniel Rechtschaffen; The Mindful Teen by Dzung X. Vo, MD, FAAP; Mindfulness for Teen Anger by Mark C. Purcell and Jason R. Murphy; The Stress Reduction Workbook for Teens by Gina M. Biegel; and other books. Improving the health and wellness of schools, students, and staff is one of the three pillars of a healthy, green school. By implementing mindfulness practices at New Roots, we have discovered that practices that we originally hoped would help students achieve greater focus in the classroom have had far greater impacts on the well-being of staff, students, and ultimately our school community. Tina Nilsen-Hodges led the founding team of New Roots Charter School and has served as head of school since the school opened in 2009. Certified as a NYS K-12 teacher, school building, and district leader, Tina taught in independent, progressive, and Montessori schools and programs for nearly two decades before moving to EcoVillage at Ithaca in 2002 seeking a community interested in starting a school focused on education for sustainability. A lifelong resident of upstate New York, Tina is passionate about the opportunities that education for sustainability offers to unlock the powerful and unique human potential of every student.